If you're unhappy with your dentures or missing teeth, a dental implant solution might be an alternative. You have the option to choose between a conventional prosthesis and implant therapy but what are the main differences? With conventional methods, the two healthy neighboring teeth have to be ground down in order to fix a bridge in place which results in a loss of natural tooth surface. The bridge does not transmit chewing forces to the jaw bone, so bone deterioration may also occur. 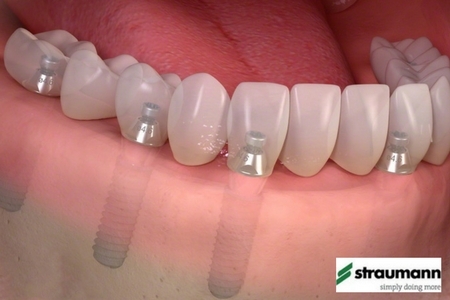 A dental implant is a small but strong post made from biocompatible metals or ceramics. The implant replaces the root of the original tooth and the healthy neighboring teeth remain intact without the need for them to be ground down. Implant therapy is is a well-proven, state-of-the-art medical dental technique- scientifically tested and used worldwide by qualified dentists and surgeons. Functionality and visual appearance go together. An implant-borne restoration looks like a natural tooth - there is no visible difference, and no special care required. Implants transmit chewing forces to the jaw bone. This is not the case if teeth are missing, or when a conventional denture has been put in place. If these forces cease, the bone may slowly recede over time. Even the best prosthesis will always be a foreign body that requires extensive care. By contrast, a dental implant is simply an artificial root, which on healing, merges with the body and acts likes a natural one.